A line of work positioning lanyards designed for straightforward work applications and normal daily use. The length of the lanyards can be changed using adjustment devices. Some of the lanyards in the line have a protective sheath which represents an additional effective protection against abrasion and extends their lifetime. All the lanyards in the KEEPSET line consist of a nylon static rope with a 12 mm diameter kernmantle weave which guarantees effective and optimal resistance against wear and abrasion. 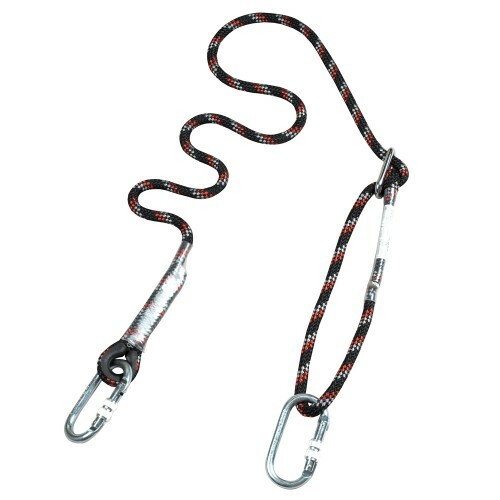 The aluminium sliding adjustment systems with automatic locking are installed on most COFRA work positioning lanyards and give the user the significant advantage of being able to adjust the length of the lanyard with simple movements, even during the most critical phases of work, thanks to the ergonomic lever socket of adjustment system. Work positioning devices are employed simultaneously in order to maintain the user in a sustained and stable position, enabling them to use both hands while working and in such a way as to prevent a free fall..